Fabulous Mountain Chalet on the River with All the Amenities you Desire!! This place was clean,and very inviting. Lots of nice little details. Kathy is amazing and great to work with. It is a pleasure working with her on this and look forward to working with her in the future. We are letting all our friends and family know how much we enjoy this. There was no laundry soap, so we were not able to start the laundry. The cabin was roomy and clean. The layout was perfect. We will definitely reserve here again! Very helpful team. So easy to schedule. What a beautiful cabin! A great way to enjoy winter. Karen was an excellent host. She was prompt with communication and friendly in all interactions. We absolutely loved our stay at Grand View. The views really were beautiful and the snow made the experience even magical. The cabin was so well-equipped, we had everything we could possibly need and more. The cabin was the perfect location for a holiday with our family. Karen was great to work with, responses quicjly, and answered all of my questions. Very nice! Elk Ridge was fantastic. The views were amazing, the cabin was cozy and clean, and it was overall a great trip! Karen was great. She answered promptly when I had questions. I really appreciated everything she did. I really enjoyed the property, and I would definitely stay again. I loved the geothermal pools that was included in our stay. I plan on going next month. Karen was very helpful and answered all my questions very promptly! Love this house! The fact that it is being worked on/upgraded is a big plus too. All people we interacted with from Idaho Vacation Cabins were very friendly and efficient. We dealt mostly with Karen, who from the beginning gave us the impression we were her only clients. I never had to explain who we were and which cabin we had rented. I would call and say hello, and she would say, 'i know who you are, how are you?'. Overall, a great experience! This cabin was absolutely beautiful, we will definitely be back!!!! Karen was phenomenal. I had many questions and she was always quick to respond and pleasant to work with! Worked very well for our needs. It was easy to get all the information I needed and all of the instructions were very helpful. This cabin was honestly breath taking from the beginning. Even though it is in a neighborhood type setting, it is totally secluded and you forget you even have neighbors. I absolutely love the porch with all the seating area and ofcourse, the hot tub!! The inside was spotless and so nicely decorated. The kitchen is beautiful and stocked with all the cooking supplies you could need. 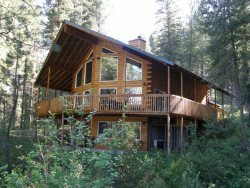 I will definitely plan another stay at this cabin when we need a break to the woods! Thank you for everything, it was perfect! We had a great time. We soaked in the community pools twice, watched several movies, went to lunch at the restaurant Terrace Lakes Golf Course and then went upstairs to the bar and played shuffleboard and pool. In the evening, we made ourselves a fabulous steak dinner and then played board games. It was the relaxing weekend we were hoping for! It was great working with Karen. We decided to go at the last minute and she made it easy to set up the details by being so responsive. I also appreciated her diligence to connect with me to provide directions. I didnt have an email on file and she had to call several times to reach me via phone because my voice mailbox was full (I didnt even know!). I appreciate that sense of urgency to connect so that we had a smooth check in. Garden Valley is only an hour and a half from Boise which makes it very accessible for a weekend get away. The directions were great so that we easily found the property despite the windy-maze-like road. The layout of the cabin offers a balance between personal space and group space which is the secret to joyful family gatherings. We spent a lot of time hanging on the porch, cooking, watching movies, and enjoying some lovely down time with each other. Well certainly be back. It was difficult to reach the property manager when we were trying to check-in. However when we called later about the hot tub she was responsive. The check-in and check-out directions were unclear because they were not specific to the house. Beautiful house, fun stay. The airbnb ad was a little misleading about proximity to the hot tub-- it was a 20 minute walk away.